The William Henry B09 Majestic Knife with Gold Koftgari, Ironwood and Damascus available at KnifeArt features exotic materials and hand-forged metals that blend with uncompromising and unique artistry to produce a remarkable high-end knife that will be a timeless heirloom to be used for a lifetime. The blade pattern was designed by Mike Norris. This is a limited edition knife. Only 100 of them have been produced, and once supplies are sold out, you may never have another chance to purchase this rarity. 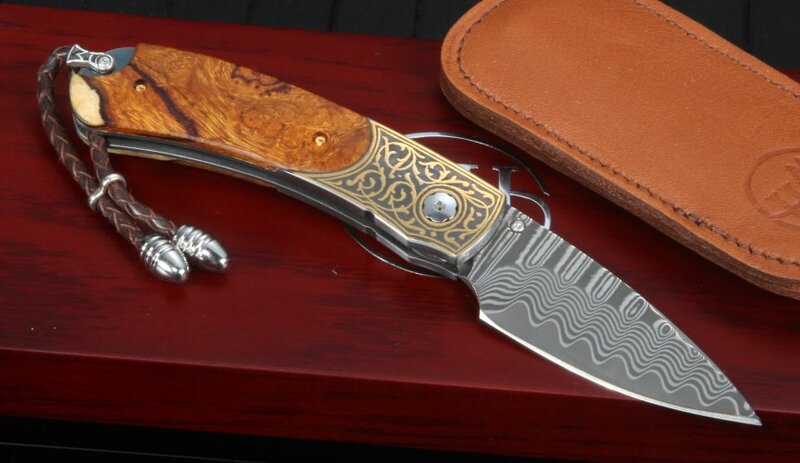 The 2.06-inch blade is made of a ZDP-189 core with a hornet's nest pattern wave damascus designed by Norris. A unique serial number is engraved into the blade. This is a compact but versatile folding knife that works and presents admirably in any situation. The design of the B09 Majestic Knife offers a deep finger groove at the intersection between the handle and blade. The knife will surprise and delight users with its high level of comfort while it is in their hand. The Majestic is small (only 1.7 ounces) and easy to carry. 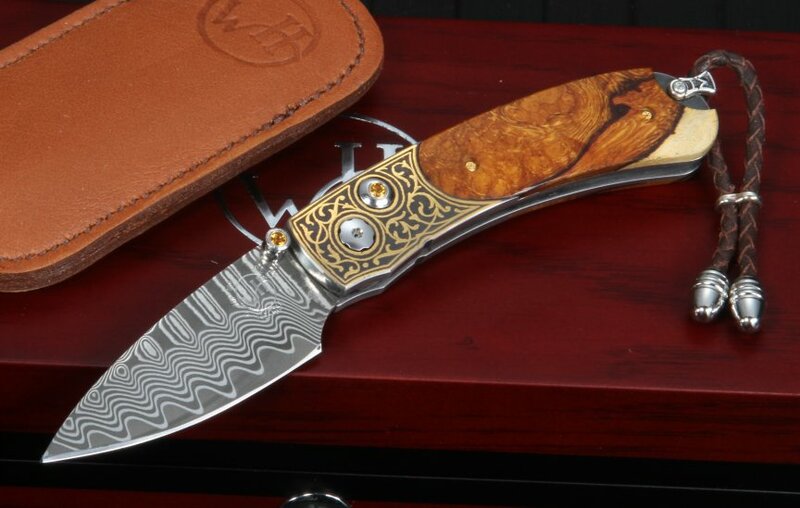 The William Henry B09 Majestic Knife's frame is made with 24K gold koftgari, inlaid with exotic and exquisite Desert Ironwood. The one-hand button lock and the thumb stud are set with Citrine. The 2.88-inch desert ironwood handle comes with a sterling silver lanyard bale, a braided brown leather lanyard with stainless steel metal beads, and a brown leather clip case. Additionally, the knife comes with a certificate of authenticity as well as a handsome wood presentation box. Buy the William Henry B09 Majestic Knife from KnifeArt and you don't even have to pay US shipping charges. Your knife will ship within 24 hours of your order on any business day. Customer satisfaction is guaranteed.